The rebellion has taken a couple of shots so far, but there have been no direct hits. Two weeks ago it was a near miss for the Dems in Kansas’s 4th congressional district. This week, hopes rested on a 30-year-old political neophyte, Jon Ossoff, in Atlanta’s 6th district. This district that has been in Republican hands since 1979 when a young, giant headed panderer by the name of Newt Gingrich was elected. Ossoff pulled in 48.1% of the vote, just missing the 50% threshold to win outright. In June, he’ll square up in a runoff against the second place finisher, former Georgia Secretary of State Karen Handel. The next election in the Democrats’ sights is the May 25th election for Montana’s sole congressional seat. In that contest, the Republicans are putting up last year’s losing gubernatorial candidate, millionaire Greg Gianforte. In the other corner is Democrat Rob Quist, a “cowboy poet and a singer.” Believe it or not, the poet is polling ahead. The GOP continues to embrace voter suppression – In Georgia, a suit has been filed to challenge the state’s stance that if you weren’t registered for the primary, you can’t vote in the runoff three months later. Federal law sets the earliest cutoff for registration as 30 days before a federal election. In Montana, there was bipartisan support for having the runoff election be by mail only. However, the state’s Republican Speaker of the House has refused to allow the bill to come to the floor for a vote because of his belief that mail-in voting favors Democrats. Montana will now spend $750,000 more to have polls open in hopes of depressing Democrat turnout. In case you were wondering, that’s more than $1 per every eligible voter in the state. Gangrene hasn’t set in yet, but the Bernie/Clinton rift has not healed – Bernie incurred quite a bit of wrath this week from Democrats. After Ossoff nearly won, Bernie was a buzzkill, initially refusing to support Ossoff since, in Bernie’s mind, he “is not a progressive.” Then Bernie traveled to Omaha to support the Democrat candidate for mayor who previously had proposed a bill requiring women be told they can view an ultrasound before an abortion and was a sponsor of a 20-week abortion ban that was signed into law. After so very many aspersions were cast about, Bernie finally endorsed Ossoff on Friday. Expect this tension to continue as the Democratic party charts its future. The answer to “Who’s The Boss?” is Samantha Micelli – Alyssa Milano has been letting out all of her teen steam and working tirelessly on behalf of Democrat candidates. She drove people to vote in Atlanta for Jon Ossoff and is now headed to Montana. I salute Alyssa for backing up her words with action (although I lied above, I still think that Mona was the boss). The week got off to a slow start for those of us in the Trump resistance with Ossoff coming up short, but boy, by the end of the week it was raining presents for progressives. The man who is among those most responsible for our current fact free society, Bill O’Reilly, was fired by Fox News. Corporations had pulled their advertising from O’Reilly’s show after The New York Timesreported that Fox and O’Reilly had settled 5 harassment claims for $13 million. Less hot air from O’Reilly is certainly good for the environment and shows that pressuring advertisers not to support hateful media can lead to change. However, let’s not get too excited. Fox News has known about his behavior for years and did nothing. He’ll likely be landing with a $25 million parachute or almost twice as much as was paid out to those he harassed. O’Reilly wasn’t the only Trump enabler on the outs this week. Chairman of the House Oversight and Government Reform Committee and someone The TrumpShaker has referred to as an “all around terrible person” Jason Chaffetz (R-UT) announced he will not seek reelection. Further, rumors are that he will not even finish his term. Chaffetz was the Benghazi hearings ringleader and promised years of Clinton investigations after she got elected. Apparently, the opportunity to investigate the actual violations of the Trump administration didn’t interest him. It’s umm, not typical, for a national political figure (outside of Sarah Palin) to just quit at the beginning of a term, so I’m thinking this is not the end of this story. Former independent presidential candidate and full-time Trump critic, Evan McMullin is mulling a run for his seat. Next thing you know, ol’ Trump’s a millionaire. Kinfolk said Trump, move away from there. 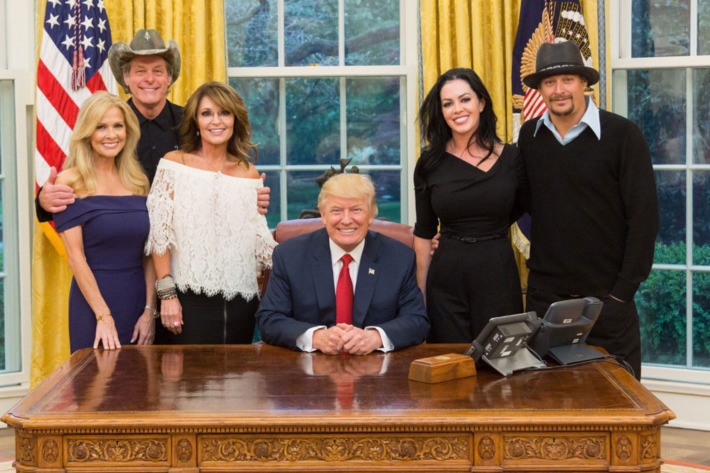 They said Washingtony is the place you oughta be, so Trump had someone else pack up his bags and he moved to D.C. . . .
Ted Nugent (and wife), Sarah Palin, Donald Trump, and Kid Rock (and fiancee) posed for what looks like the promo for a a terrible CBS show. Nugent, you may recall, was under investigation in 2012 by the Secret Service for threatening President Obama. All Oceans Lead to Pyongyang – Unfortunately, I need to print my first retraction. 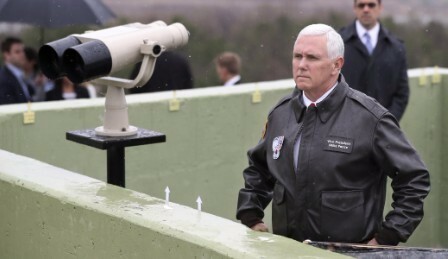 Last week, I noted that Trump sent a fleet to North Korea. Well, he didn’t. I didn’t know that, and apparently, neither did he. Everyone thought the USS Carl Vinson and its accompanying ships were heading to North Korea since Trump said, he was “sending an armada” there. Well, everyone thought that until a photo came out showing the aircraft carrier heading the opposite direction towards the Indian Ocean. The fleet is finally now heading towards North Korea. Rather than admit they either lied or lost the ships like one of Trump’s remote controls in the couch cushions, the administration said that we totally misunderstood. White House Spokesman Sean Spicer “clarified” that when the administration said the ships were headed to North Korea, it meant that they eventually were going to make it there. You know in the existential way we are all headed to the same place. Spicer explained, “We said that it was heading there, and it was heading there, it is heading there.” Korea was its “ultimate destination.” You know, they were heading there because the earth is round. At least that’s one bit of science the Trump administration still believes in. You know who doesn’t think all this word play about pretending to send military support is cute? South Korea. Put them on the big board of allies Trump has angered. Talking Turkey – As The TrumpShaker went to press last week, President Erdogan expanded his power to near dictatorial levels. He won by 2% of the vote in an election in which Vote and Beyond, a Turkish NGO, found that votes in 2397 ballot boxes exceed the number of voters. What did Trump do when a strongman pushed a democracy teetered towards authoritarianism? He called to congratulate Erdogan, aspiring dictator to aspiring dictator, and invite him to the White House. In between threatening to take funds away from sanctuary cities and calling NYPD “soft on crime”, Attorney General Jefferson Beauregard Sessions III expressed his frustration that a judge in Hawaii had put a halt to Trump’s Muslim Ban 2.0. Sessions declared, in I imagine a Foghorn Leghorn voice, “I really am amazed that a judge sitting on an island in the Pacific can issue an order that stops the President of the United States from what appears to be clearly his statutory and Constitutional power.” Apparently this former representative of a state that had once seceded from the United States is still not comfortable with Hawaiian statehood. Also, given that Session was found too racist in the 80’s to be approved for a federal judgeship himself, perhaps its not shocking that he would question the legitimacy of the only Native Hawaiian on the federal bench. Follow the Rubles – In a move that everyone in the world saw coming, Exxon asked the Treasury Department for a waiver to restart its joint venture with PAO Rosneft. Rosneft is an oil company owned by . . . one guess . . . yes, Russia. And who signed the joint venture in the first place . . . need a hint? Okay, he won Russia’s Order of Friendship award. Yes, it’s our very own Secretary of State Rex Tillerson. Oh, I should say that everyone saw this coming except for Senator John McCain (R-AZ), who tweeted, “Are they crazy?” in reaction. The only crazy person in this situation is Senator McCain who voted to confirm Tillerson despite his close Russian connections. The Treasury Department came through though and did not issue the waiver. However, Exxon is set to invest $500 billion in Russia if the waiver is ever granted, so don’t expect this to be the last time we hear this request. One More Casualty for Mitch McConnell – Senator Mitch McConnell (R-KY) destroyed the Senate rules and the Supreme Court nomination process to put Neil Gorsuch on the Court. After killing democracy, McConnell can now add one more to his death toll. Justice Gorsuch’s first decision was the deciding vote to deny the stay of execution of Ledell Lee in Arkansas. Filling the Swamp with Pesticides – Dow Chemicals, which donated $1 million to Trump’s inauguration, and whose CEO leads a White House working group, has asked the administration to ignore the findings of federal scientists, which showed a family of their pesticides as harmful to 1,800 threatened or endangered species. Trump’s inauguration received over $107 million in donations from sketchy (and in some cases totally made-up) sources. I expect that Dow’s will not be the last poison introduced into the Republic’s bloodstream from these inauguration donations. (100) Days of Bummer – The symbolism is a little too perfect, but on Trump’s 100th day in office, the federal government will shut down unless a spending bill is passed. To avoid a filibuster, Republicans need 8 Democrats votes and Democrats are not budging on funds for the wall or immigration enforcement. Will Trump blink or will he use the master negotiating skills that helped him crash and burn on Obamacare reform? Henry Kissinger damned Jared Kushner with the faintest praise possible in his write up on Kushner for Time Magazine’s 100 most influential people on earth. A very important and very scary French election is happening right. I’ll have a full breakdown next week, but here is a primer pour vous from Slate. Bruce Springsteen and Joe Grushecky released a new anti-Trump anthem called “That’s What Makes Us Great”. Last weekend, we marched for taxes. This weekend, we march for science. Next weekend, in Washington D.C. it’s time to march for the climate. 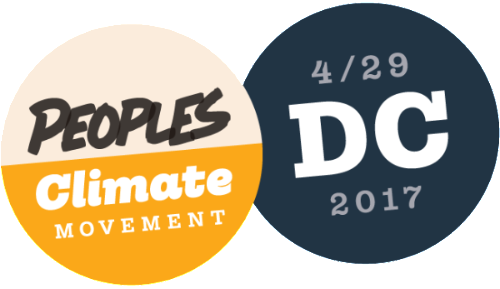 Join the Peoples Climate Movement and make your voice heard by the Trump administration as it squanders any time left to slow climate change.